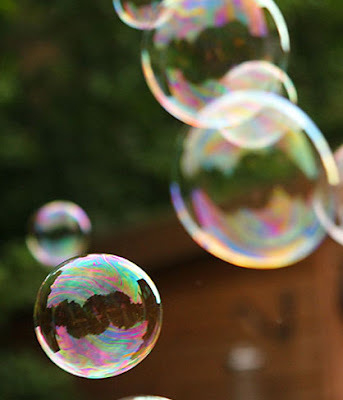 I love bubbles. They are beautiful and iridescent and weightless almost. I love how they contain a chorus of Cinderellas as she is mopping the floor. I love how nothing bad ever comes out of a bubble. They are happy little things that bounce all over and give children (and me) hours of fun blowing them and popping them. For most of my life I lived in a bubble. It was a beautiful bubble where the world was kind and good and people were all full of goodness and wanting to help each other. When I got married I began to emerge from my bubble. My husband just knows so much about the world and history, and he loves sharing it with me. I confess, I do love learning, but not to the extent of leaving my bubble! My neighbors decided to put together a Neighborhood Watch program. I went to it. I am included in the Neighbors" after all. I emerged a little more from my bubble. No worries, I thought. I went home, going about my business as usual. The Boss woke up in the middle of the night because he couldn't find his Bear. I went in, comforted him, gave him extra hugs and kisses because I am so lucky to have him, and he is so perfect. When he had almost fallen asleep in my arms- I know, I spoiled him last night with loves- I put him back to bed, then went out and got a drink. That is when I emerged a little more from my bubble. I walked past the front room door. I have a wreath hanging on the outside of it. The shadow looked like a silhouette. I was terrified it was someone trying to break in again. I ran to my bedroom and buried my head under the covers and waited for my heart to stop beating. My head laughed at me the whole time, knowing it was the wreath, but the heart that was pumping cold blood to my limbs just wouldn't listen. I am thinking I don't want to go to any more "Community Awareness" meetings or activities. I prefer my bubble, thank you! I love bubbles too! Nick and I would always bring them to sunbeams so we had something for the kids to try to be good for. Also about the neighborhood, I'd probably be kind of scared too if I lived there. It is sad how such a nice little town has become a place for so much criminal activity! I totally hear you about preferring to live in a bubble. There are so many scary things going on in the world it just makes me want to hide away my whole little family. I know it's irresponsible (I should know what's going on in the world) but I don't even turn on the news anymore because I just can't stand to hear about all of the bad things that are happening. are we still on for 5pm tomarrow? hahahaha, i'm scared of the dark too!!! i finally answered your questions on my post today!